Tseng Kwong Chi (1950-1990) was a Hong Kong-born American photographer who was active in New York City’s East Village art scene in the 1980s. The artist’s most well known body of work is his series of performance-based self portraits, East Meets West. Inspired in part by the highly-staged photo ops of Richard Nixon’s 1972 trip to China, the series reflected upon the increasingly globalized movement of people across nations and continents, while also poking fun at prevalent western stereotypes of Chinese culture. Donning a traditional suit modeled after Chairman Mao, with mirrored sunglasses and a fake I.D. 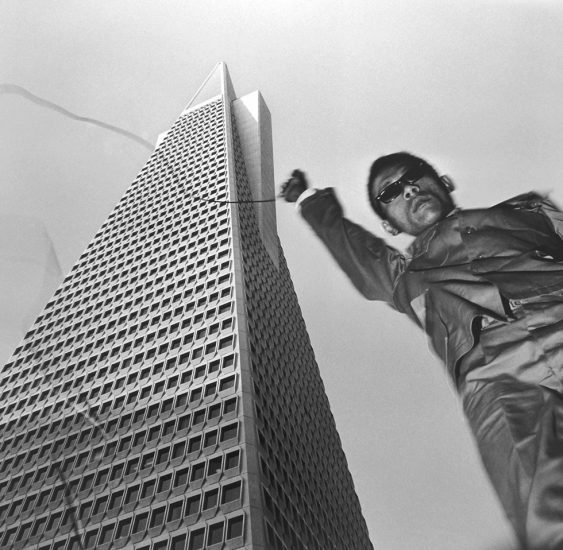 card clipped to his chest pocket, Tseng embodied the persona of an “inquisitive traveler, a witness of my time and an ambiguous ambassador,” posing and photographing himself in front of iconic landmarks around the world over a period of more than a decade.